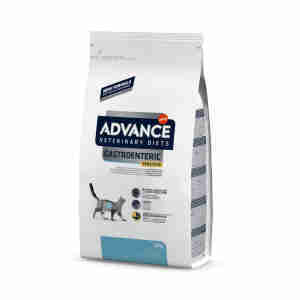 Advance Veterinary Diets Gastroenteric Sensitive Cat Food is a complete, highly digestible dietetic food for adult cats that helps support digestion. Advance Veterinary Diets Gastroenteric Sensitive Cat Food was designed to reduce of ingredient and nutrient intolerances. It's ideal in for gastrointestinal disorder and exocrine pancreatic insufficiency. With rice and vegetable fiber which are easily digestible, this kibble helps the absorbtion of nutrients and improves digestive function. Rich in prebiotics and Omega 3 fatty acids, it develops healthy intestinal flora and reduces inflamation. 14% fat level and vitamin B12 supplement make this recipe suitable for reduced food intake in cats with gastrointestinal disorders or pancreatitis. Turkey and pea proteins and gluten-free ingredients help minimise the risk of adverse reactions to the food. Moderate level of fat contains 14% fat, the required and suitable amount for reduced food intake in cats with pancreatitis. Because veterinary diets are formulated for the nutritional support of pets with specific clinical conditions, we recommend that you only use them under professional advice. Please consult your veterinary surgeon. Rice, dehydrated turkey protein, pea protein, hydrolysed animal proteins, animal fat, hydrolysed soya protein, dehydrated peas, yeast, fish oil, coconut oil, vegetable fibre, potassium chloride, fructooligosaccharides. Vitamin A (IU/kg) 22848 - 24835, Vitamin D3 (IU/kg) 1540 - 1674, Vitamin E (mg/kg) 315 - 342, Vitamin K3 (ppm) 0.5 - 0.6, Vitamin B1 Thiamine (ppm) 59 - 64, Vitamin B2 Riboflavin (ppm) 26 - 28, Vitamin B6 Pyridoxine (ppm) 16 - 17, Vitamin B12 Cyanocobalamin (ppm) 586 - 637, Niacin (ppm) 216 - 234, Pantothenic Acid (ppm) 51 - 56, Folic Acid (ppm) 6.7 - 7.3, Biotin (ppm) 9.4 - 10.2, Vitamin C (ppm) 350 - 380, Iron (ppm) 200 - 218, Zinc (ppm) 251 - 273, Copper (ppm) 22 - 2,4 Manganese (ppm) 76 - 82, Iodine (ppm) 2.0 - 2.2, Selenium (ppm) 0.6 - 0.7, NFE [Nitrogen-Free Extract] (%) 35.0 - 38.0, Linoleic acid (%) 1.9 - 2.0, Linolenic acid (%) 0.15 - 0.16, MCT [Medium Chain Triglycerides] (%) 1.2 - 1.3, Omega 6 (%) 1.6 - 1.8, Omega 3 (%) 0.9 - 1.0, Omega 6: Omega 3 1.7, - Metabolisable energy (kcal/kg) 3,810. Moisture 8%, Protein 35.0%, Fat content 14.0%, Crude fibre 2.0%, Inorganic matter 8.0%, Calcium 1.2%, Phosphorous 1.1%, Sodium 0.7%, Chloride 0.8%, Potassium 0.8%, Magnesium 0.08%. Always make sure your furry friend has access to plenty of water. My 10 year old persian suffers from Colitis amongst other gastro problems Esp with diarrhea if he has been naughty and eaten one of the other cats food that doesn't agree with him & felix “as good as it looks” being the main culprit! This helps immensely. Just a little palmful a day and he is his normal self. We bought this food as one of our cats has pancreatitis. He loves the taste and texture and always clears his bowl.